Although the South West Monsoon has set in with heavy to moderate rainfall the weather has not been always wet. Most of the planting districts have experienced spells of bright weather which has helped to sustain crop intakes at moderate levels. On the other hand the Eastern sector has had very little rainfall with conditions being mainly bright and sunny with reports of seasonal blowing in a few districts which is customary during this period. If the weather does not intervene we could soon see some bright liquoring teas entering the market from this sector, with flavoury teas to follow. On the global stage in addition to the healthy North Indian crops prices for Assams second flush quality has shown significant increases with internal demand for these teas being buoyant. The volumes on offer at the Kenyan auctions are expected to drop with the onset of the cold season in the Highlands, East of Rift. Central districts and Nandi Hills are already experiencing colder conditions. With volumes dropping a firmer market is expected particularly for the brighter teas. Last week's 1.3 mkgs of Ex Estate teas met with lower demand and prices for both BOP and BOPFs declined by Rs15 to Rs 20 on average. In the Western High Grown category a few select Best BOP and BOPFs barely maintained, whilst others declined Rs 10 to Rs 15 and more as the sale progressed. 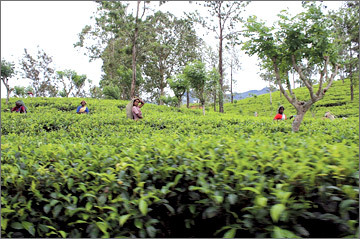 Nuwara Eliya's mostly maintained, whilst Uva's declined by Rs 10 to Rs 15 on average. Other than for the Best Low Grown CTC PF1s which were around last week levels, all others were badly neglected with a little or no interest. The High and Medium types too eased Rs 20 to Rs 25 with substantial weight remaining unsold. The tea bag sector and Russia was selective, whilst UK, Japan and Continental buyers too lent only a little support. The larger volume of 3.9 mkg of Low Growns that were on offer last week, met with good demand but at lower levels. A few select best BOP1 and OP1s maintained last levels, whilst all others declined several rupees. The shotty Pekoe1s too met with improved demand with prices gaining, however the rest on offer declined Rs 5 to Rs 10. Best and below best OP and OPAs too declined with the exception of the stalky varieties which gained in value. In the Small Leaf category too the prices of FBOP and FF1s met with a lower market. The Tippy varieties also saw price declines. The average of Rs 374.61 for Orthodox Low Growns at the sale of June 8 2011 is around Rs 8 higher than the corresponding auction of 2010. The Orthodox Low Grown average for the period January 1 to date which is Rs 392.73 is also marginally higher than the same period of 2010. Considering the larger volume that were on offer this year, prices have remained firm for Low Grown varieties. Select Best BOPs declined Rs 5 to Rs 10, other good invoices were firm to marginally easier, Below Best sorts were firm to irregular, plainer varieties maintained last levels. Select Best BOPFs eased Rs 10 to Rs 15, other good invoices declined Rs 10, Below Best sorts were irregularly lower, plainer varieties were firm to dearer. Medium BOPs eased Rs 15 to Rs 20, whilst BOPFs were firm. BOPs eased Rs 10. BOPFs were firm to Rs 5 dearer. BOPs eased Rs 5 to Rs 10, whilst BOPFs declined Rs 15 to Rs 20 on average. Uda Pussellawa BOPs were irregular, whilst BOPFs shed Rs 5 to Rs 10. Select Best Low Grown PF1s eased Rs 10 to Rs 15, others declined Rs 20 on average. BP1s gained Rs 15 to Rs 20. High & Medium PF1s shed Rs 15 to Rs 20 with a large volume remaining unsold. BP1s eased Rs 10 to Rs 15. Fair demand but at lower levels to last. Select Best OP1s declined Rs 10 to Rs 15, the balance too tended lower by a similar margin. Select Best BOP1s maintained last levels, however the Best types shed Rs 10 to Rs 15, Below Best and poor sorts too were irregularly lower by Rs 5 to Rs 10. A few Selected OPs in the Select Best category appreciated Rs 10 to Rs 20, however the balance declined Rs 5 to Rs 10 and more at times. Select Best OPAs appreciated Rs 10 to Rs 15, Best types gained Rs 5 to Rs 10, however Below Best and poor sorts shed Rs 5 to Rs 8 following quality. Select Best Pekoes advanced sharply by Rs 20 to Rs 30, Best types were steady, Below Best and poor sorts tended lower by Rs 5 to Rs 10. Shotty Pekoe1s gained sharply by Rs 30 to Rs 50 and more at times, Best types too appreciated Rs 10 to Rs 20, however Below Best and poor sorts tended lower by Rs 5 to Rs 10. Select Best BOPs maintained, however Best and Below Best types shed Rs 5 to Rs 10, poorer sorts were firm. Select Best BOPSP were barely steady, Best and Below Best types were lower by Rs 10 to Rs 20, poorer types too were lower by Rs 5 to Rs 10. Select Best and Best FBOPs shed Rs 10 to Rs 20 and at times more as the sale progressed. Below Best types too were lower by Rs 10 to Rs 20 and at times remained difficult of sale due to lack of demand, poorer types shed Rs 10 to Rs 20 Select Best FBOPF1s were lower by Rs 10 to Rs 20, Best and Below Best types declined Rs 20, poorer sorts were lower by Rs 10. Select Best and Best Tippy varieties were much lower to last, Below Best and poorer sorts shed Rs 20 to Rs 30. Select Best liquoring Fngs1s appreciated by Rs 5 to Rs 10, whilst the Below Best and poorer sorts sold at firm levels. Select Best BMs were firm to dearer by Rs 5 to Rs 10, whilst the Below Best and poorer sorts shed Rs 10. All Low Grown Fngs were lower by Rs 10 to Rs 15. All BPs were firm to dearer by Rs 10. Select Best and Best BOP1As eased Rs 10 to Rs 15, whilst Below Best and poorer sorts too shed by an average of Rs 10 from last levels. Select Best Dust1s declined Rs 20 to Rs 25, whilst the Best and Below Best types shed Rs 10 to Rs 15, others declined further. Clean secondaries gained Rs 5 to Rs 10, whilst the balance shed Rs 10 to Rs 15. Best Low Grown Dust and Dust1s eased Rs 10 to Rs 15, whilst the balance were irregular. HVA Group it has been certified as an accredited production facility to supply Ceylon Tea to Iran under the GMP authorization issued by the Iranian government. 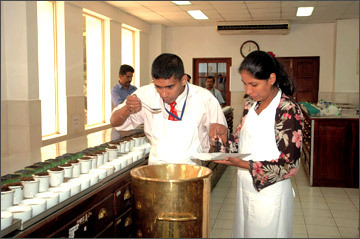 A stringent quality driven accreditation, this endorsement reaffirms the company’s focus on maintaining the best of standards in the manufacture of tea and commodities from Sri Lanka. The largest tea markets for the top five exporters in Sri Lanka are Russia, Iraq and Iran and during its 20 years of operation Heladiv has increased its competitiveness by laying the foundation in all these markets - making a rapid growth in both value added and bulk tea exports and offering a variety of innovative products matching the needs of the discerning customer. 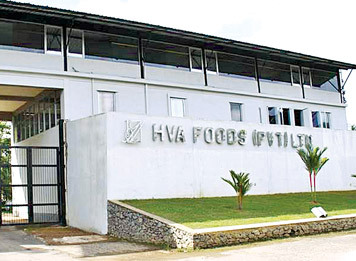 A hallmark of this product development has been the development of HVA’s flagship product; ready-to-drink Heladiv Ice Tea, which enhances the brand’s momentum by adding vigour and new age delivery offerings to key markets where the youth is driving growth. Envisioning being a leading supplier of multi- origin teas from strategic locations in the globe, HVA has put into gear a major expansion drive which includes both local strategic development as well as regional manufacturing facilities as joint venture operations - thereby strengthening its mission to set the pace for positive changes in the Tea Industry. By building a brand of Ceylon Tea that is the preferred health drink around the world, Heladiv Tea is engaged in delighting its customers with an outstanding quality product. “We believe in hard work and integrity. These are the two most vital ingredients that have made us strong today. As we celebrate yet another colossal milestone in the history of our company, we renew our energies and set our course on the path of the future,” HVA Group Chairman Rohan Fernando said.